Their words came set against a backdrop that read “Welcome” and “#GameChanger.” The arena’s specifications — detailed in a pamphlet distributed at the grand opening with “Changing the game in South Texas” printed on the cover — live up to the popular tag line. The venue boasts 9,324 seats, 15 luxury suites, a 44- by 19-foot LED scoreboard, 78 points of sale, three restaurants and two concession partners all filling the 219,000-square-foot venue, a list of marks unmatched by any arena in the Rio Grande Valley’s history. Now, the challenge for those operating the facility is to take game-changer from a noun to a verb. All seven of the acts booked at the venue — a group that leads with a performance by Luis Miguel today — have previously played at Hidalgo’s State Farm Arena. Currently slated to appear at Bert Ogden Arena are George Lopez, WWE Live and four musical artists: Alejandro Fernandez, J Balvin, Romeo Santos and Marc Anthony. Regarding the arena’s opening lineup, Solis preaches patience. A grand opening with an act the likes of which the Valley has never seen before sounds great in theory but can be more difficult to achieve in practice. In many cases, top acts can only be lured once a venue has proven its credibility. Solis said the arena is on the right path, with an experienced management team building off of established reputations with agents and promoters. Solis previously filled a similar role at State Farm Arena, and he said looking at his booking process there versus at Bert Ogden Arena is like comparing apples to oranges due to the new venue’s polish and seating capacity. Arena business tends to be cyclical in nature, Solis said, with the bigger shows running October through May. The challenges of a summer opening were also compounded by the lack of a firm completion date. As recently as the second week of July, when WWE Live was announced as the arena’s first sporting event, Solis left the door open to an act other than Luis Miguel opening the arena. The early response from the Valley community has been another promising sign. Solis estimated that about 5,000 people attended Sunday’s open house event, and Vackar said he was astounded by the enthusiasm he saw from the visitors. Janet Vackar, Robert’s wife and the daughter of Bert Ogden, stood in the arena’s main entrance for about four hours greeting visitors Sunday. A positive early response is a critical sign, as Solis said the arena’s offerings can grow only with the community’s support. Alonzo Cantu, who funded a large portion of the venue’s construction costs through a public-private partnership with the city of Edinburg, said a strong turnout is critical to helping the arena reach its peak. Speaking from the podium at Monday’s ribbon-cutting, Molina said Bert Ogden Arena puts the Valley “head and shoulders above the region.” He said he knows the feeling of having to travel to San Antonio or Corpus Christi to watch a big event and sees the potential for Bert Ogden Arena to bring those same attractions to his own city. And for anyone claiming the acts are stale, Robert Vackar points to ticket sales. Though bigger shows new to the region may be in the pipeline, the current crop has sparked a great deal of interest. The Mexican singer and icon is in the midst of his ¡México Por Siempre! Tour. Two days before the Hell in a Cell pay-per-view event, WWE’s Raw brand brings a show headlined by a Universal Championship match between Roman Reigns and Braun Strowman. Also among those scheduled to appear: Ronda Rousey, Alexa Bliss, Seth Rollins, Dean Ambrose, Finn Balor, Kevin Owens, Dolph Ziggler, Drew McIntyre and Bobby Lashley. Two Mexican acts combine on the Rompiendo Fronteras Tour. Fernandez has sold more than 30 million albums worldwide covering an array of genres from mariachi to pop. The Mexican-American comedian and actor who starred in his eponymous self-produced ABC sitcom and hosted his own late-night TV show brings his stand-up routine to Edinburg. TICKETS: Season tickets for the Vipers’ 2018-19 season on sale at (956) 562-7362. 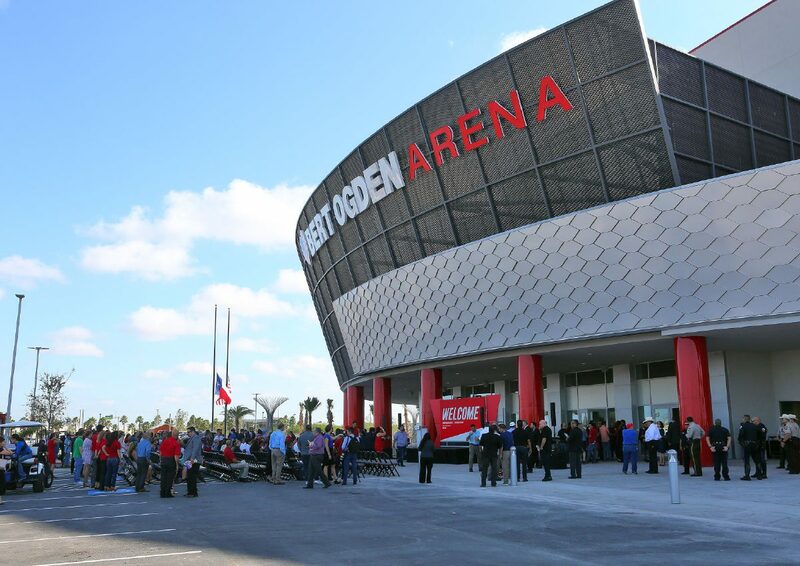 The NBA G League affiliate of the Houston Rockets will open their 12th season and first in Edinburg with a matchup against the Memphis Hustle — the first of 24 Vipers home games at Bert Ogden Arena. A two-time Grammy Award winner and five-time Latin Grammy Award winner, Anthony has sold more than 12 million albums worldwide.